Need more information about booking Home 201622 ? Our child and pet friendly cottage is situated in the historical village of Nefyn on the beautiful Lleyn Peninsula.The cottage has been renovated to a high standard and is fully equipped for babies and children. The beautiful sandy beach is a 10 - 15 min walk away. The cottage is ideally situated for touring the Lleyn Peninsula and Snowdonia. It has has been fully renovated to a high standard with a log burning stove for cosy winter nights, and a garden at the front for summer barbecues. The peaceful setting makes this property ideal for a relaxing break at any time of year. Free unlimited Wi-Fi throughout the cottage with Smart TV/ Apple TV and NOW TV - available with use of a NETFLIX/ Sky Movies/Entertainment account. The cottage is fully equipped for families with small children, including travel cots, stair gates, baby bath, high chair, bed guard, fire guard and stroller. New children's playground 3 minutes walk from the property (under 10's). Great care has been taken to make your stay is as comfortable as possible. Please note that Holiday Lettings give a daily rate based on a full weeks let at low season. https://youtu.be/QXtEcfrbxao . To keep our prices down bed linen is not included and you are welcome to bring your own. Alternatively, this can be provided by our housekeeper at £5 per bed. The cottage sleeps a maximum of a 6 and is ideal for couples and families. Please note the cottage would not be suitable for a party of 6 adults. Free parking is available, 3 mins walk from the cottage. One dog allowed at no extra charge but due to the size of the property, we are unable to take large breed dogs (Great Dane, St Bernard). Once the balance payment is received, we email our guests a detailed information pack, which has key/ directions and trip information. We do not charge anything extra for your dog but we kindly request that dogs are not allowed upstairs and kept off the furniture. This Cottage has 3 bedrooms, 1 bathroom and sleeps 6. It’s been listed on Holiday Lettings since 17 Jan 2012. Located in Gwynedd, it has 51 reviews with an overall rating of 5. The average weekly rate varies from £330 to £575. Nefyn is a very unspoilt, tranquil village on the north coast of the Llyn Peninsula with a beautiful beach and stunning scenery. The larger towns of Pwllheli and Portmadog are only a short drive away, as are many other stunning beaches. Kathy, the owner, was very helpful throughout the booking process and thought of everything to make our stay as comfortable and enjoyable as possible. My husband, our two children and I stayed at Troed Y Garn for a week over the Christmas period, along with our small dogs. The cottage was beautifully decorated for the festive period and was extremely well-equipped with everything we could possible have needed (including a chilled bottle of Prosecco!). The cottage was very well maintained with lovely decor and spotlessly clean. I can honestly say that we have never stayed anywhere that has catered for our needs in such a thoughtful and caring way. From the fuel for the fire upon arrival to the Alexa App! I am sure this will be the first of many visits. Many thanks to Kathy and her team. Owner's reply: Thanks, Amanda for your lovely review and taking the time to post one. We're glad you had a wonderful Christmas at the cottage and we hope to welcome you again very soon. My family and I stayed at the cottage for four nights and had a lovely time! The weather was dry which we made the most of! The cottage has every modern convenience needed, and the log burner made it even cosier. The owner, Kathy, provided a great deal of useful information before our trip. Especially useful, was the attachment about days out and beaches to visit on the peninsula, so make sure you read that. The first night, we bought fresh meat and vegetables at Spar in Nefyn. The lamb and the gammon were delicious. I read in the Holiday information that Spar will deliver too. The decor of the cottage is tasteful and the furniture is extremely comfortable. I can see why so many people choose to return here. We brought my dad and our two children, aged 7 and 9. The children loved the Netflix and the fact that the tv had you tube kids on it. We chose days out on beaches. We travelled to Aberdaron, which has a lovely beach, and a few coffee shops too. One hotel has a balcony directly on the beach. We also travelled to Abersoch beach, and found all we needed in the shed at the cottage. I can see why dog lovers return to the cottage, as so many of the beaches are dog-friendly. So if you want to try a holiday letting of a very high standard, check the availability, as it’s booked up quickly!! Don’t miss out!!! Owner's reply: Thank you Rachel for such a lovely review! I appreciate you taking the time to share your experience and great to hear that you all had such a wonderful time. The area has so much to do... even now, 30 years on, we're still exploring new places and walks! We really look forward to you staying with us again. 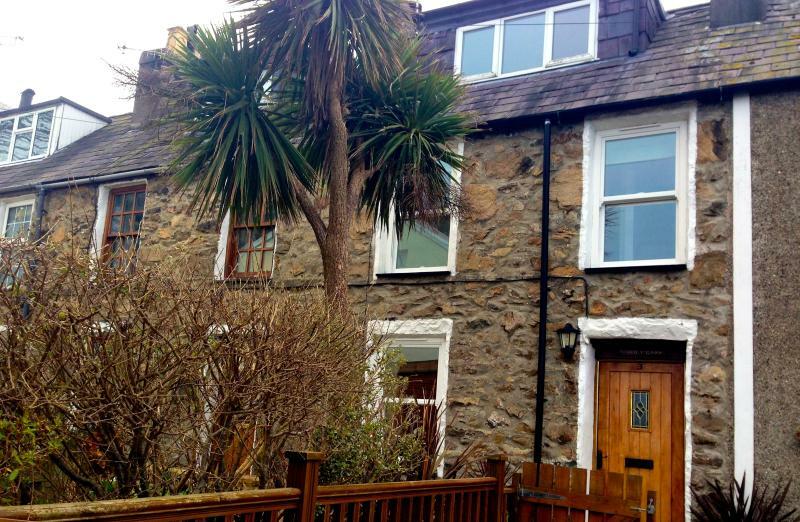 A lovely quiet terraced cottage in the heart of Nefyn. Nefyn is a great hub to discover the beauty of the Llyn. If you don't fancy going to far, explore Nefyn Beach or go for some refreshment at Ty Coch at Morfa Nefyn. Be adventurous and check out Aberdaron or maybe Port Merion. The cottage is so well equipped with lovely comfortable beds, games for the family and fishing nets should you need them. The cottage also has an area in the front which is great for sitting out. Parking is in the old church where the local allotment and children's playground is. This is 250 metres from the cottage. We loved it and rate it highly and will definitely return. For people with physical disabilities please note that the stairs are quite steep but even that is catered for with banisters on either side of the stairs. Owner's reply: Thank you for taking time to write a review for us and your lovely positive comments. We hope you book with us again soon. Thank you for a fantastic week away on our first holiday with our 5 month old. The cottage was perfect, a real home from home & having baby equipment really helped. The welcome pack was so useful with some great ideas for trips out. Can't wait to stay again. Owner's reply: Thank you for taking time to review the cottage and your lovely comments. The cottage was more than I expected. Not far from the lovely Nefyn beach, while we were there for a long weekend we saw a Seal looking for fish in the waters.Great walks, not too far from Abersoch which was a lovely day out. Would recomend a car to fully explore some of the local scenery and great days out, for example Portmeirion, Betws y Coed, Caernarfon. After our days out we retired to the cottage which was cosy and had a lovely open fire. There are lots of different places to eat out or take out within walking distance. The cottage was to high standards with many little querky features. I Would recomend this cottage to families I will definately go again and take my dogs. Thanks to Kathy for a great stay you have a lovely cottage at a very reasonable price. Owner's reply: Thank you for your lovely comments and we hope to welcome you back again soon. My family and I stayed in this cottage at the end of October. We immediately fell in love with the cottage, it's a beautiful, charming cottage with basically everything you would need supplied. The booking was very easy, I found the owner very helpful. There is nothing I can say that is negative, we are planning on returning next year and hopefully many more after that. Thank you so much for an incredible stay! Owner's reply: Thank you for your lovely comments and we look forward to welcoming you and your family again. We really enjoyed our stay in the cottage. Communication with the owner was excellent and we received a really comprehensive information pack before we went. The property is really well equipped and had everything we needed. There were 5 adults in our party and I felt that this was probably the maximum that the house could hold comfortably, and 4 is probably the ideal. The only downside was parking but we found that we could park near the end of the walkway to the house to unload the car. The car parking is literally a couple of minutes walk away. Owner's reply: Thank you for your lovely comments and taking the time to write a review for us. We hope to welcome you again. We have just had a week at the cottage, four adults, two teenage girls and one dog ! The cottage was charming and we fitted in really well, excellent kitchen for a small place and very well equipped, we really wanted for nothing. Great shower and extremely comfortable beds, luckily had some good weather so had days on the beach at Nefyn, also spent a day at Abersoch, the girls had fun in the kayaks at the local watersports centre, all in all I would say it was a very enjoyable experience. Owner's reply: Thank you taking the time to post a review and your lovely comments. We hope to welcome you again soon. We had a lovely stay at Nefyn Cottage. Prior to the holiday the communication with the owner was friendly and the information provided was great. I have to say that the facilities in this cottage are the best I've known, everything has been thought of by the owners. The lounge and master bedroom are very comfortable both with a charm in keeping with the age of the cottage. The kitchen and bathroom are modern, practical and have every convenience to make life easy, which therefore made our holiday more relaxing. We were lucky to have excellent weather and used the patio to eat and have an evening drink. The cottage is in a peaceful corner of Nefyn village, so it feels as though you are in a quiet hamlet. However there is well stocked (inc local and Welsh produce) Spar within walking distance. There are plenty of walks from the cottage, Nefyn beach is ten minutes away and is great for a walk or paddle. A little further but still within walking distance is Morfa Nefyn beach, Porthdinllaen and the famous Ty Coch Inn. The golf club is also very welcoming and we found served the best food in Nefyn/Morfa Nefyn. There is plenty to do on the beautiful Llyn Peninisula and I won't bore you with all the things we did, but I will say the beaches in this area are second to none and you will discover your own favourite, ours were Porth Oer (Whistling Sands) and Porth Iago (There's a car park but it's a steep walk). Don't hesitate in booking this cottage it's location and facilities will allow for a great holiday. Owner's reply: Thank you for your lovely review and your kind comments. We hope to welcome you again soon. Owner's reply: Thank you very much for the lovely comments and taking the time to write an informative review for us and our prospective guests. We hope to welcome you and your family again soon. You can get in touch with Kathy (the owner) through the contact form on this page. Send Kathy (the owner) an email through the contact form on this page. Alternatively, if there’s a phone number on this page, you can call them. How do I contact Kathy (the owner)? You'll need to send Kathy (the owner) an enquiry to book - the owner will let you know how to pay. If they accept online booking they'll send you a quote and info on how to pay. If you pay through our website you’ll be covered by Payment Protection. Or you can send Kathy (the owner) an enquiry through the contact form to request a quote. Kathy (the owner) will email you the total cost for your dates and how to pay. Send Kathy (the owner) an enquiry through the contact form requesting a quote for your holiday dates. Kathy (the owner) will email you the total cost for your dates and how to pay. Kathy (the owner) of this property is responsible for taking and refunding your damage deposit. The damage deposit terms should be agreed before booking and outlined in the booking contract, if Kathy (the owner) supplies one. Please refer to these details or contact Kathy (the owner) directly if you have any questions. You'll need to contact Kathy (the owner) to cancel. They should have provided their contact details when you made your booking - otherwise, email them through the contact form. You'll need to contact Kathy (the owner) to edit your booking. They should have provided their contact details when you made your booking - otherwise, email them through the contact form.